The three-wheel Honda 3R-C concept is a vision of a green commuter car. 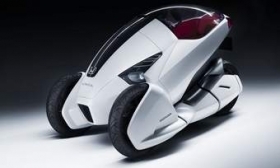 Honda is bringing a three-wheel, one-person battery-electric concept to the Geneva auto show. It's called the 3R-C, and it's Honda's vision of what a green urban commuter car could look like. This is for close-quarters maneuvering, so it's not big. The battery-electric drivetrain is mounted low in the chassis, which makes for a low center of gravity and improved stability. There's also a clear canopy that covers the driver seat when not in use, and it acts as a windshield when the 3R-C is in motion. The driver sits low in this ride, which Honda says offers maximum protection. There's also a small storage area for cargo. The 3R-C will be joined in Geneva by the EV-N concept, which was previously shown at the Tokyo auto show, and the FCX Clarity, which is being leased to consumers in the United States and Japan.